Happy April! Is it just me or does this spring seem to be flying by before our eyes? Maybe it is just this getting older thing that makes time seem to speed up. In any case, I hope you all had a wonderful Easter! I am excited to share my little Easter Brunch birthday party, but since I’ve still got a few photos left to edit, today I thought I’d share this quick & easy ombre vase project that I used as my table centerpiece. Any project that costs less than $7 in supplies (for all 3 vases), takes less than 30 minutes to complete gets high marks in my book. Frankly, I am in LOVE with how these turned out! Most of the supplies you probably already have on hand, but for the paint I highly recommend the Martha Stewart brand high-gloss acrylic paint. Unlike regular acrylic paint, this brand works on all surfaces, including glass. It is found by the other acrylic paints and runs about $2 a bottle. 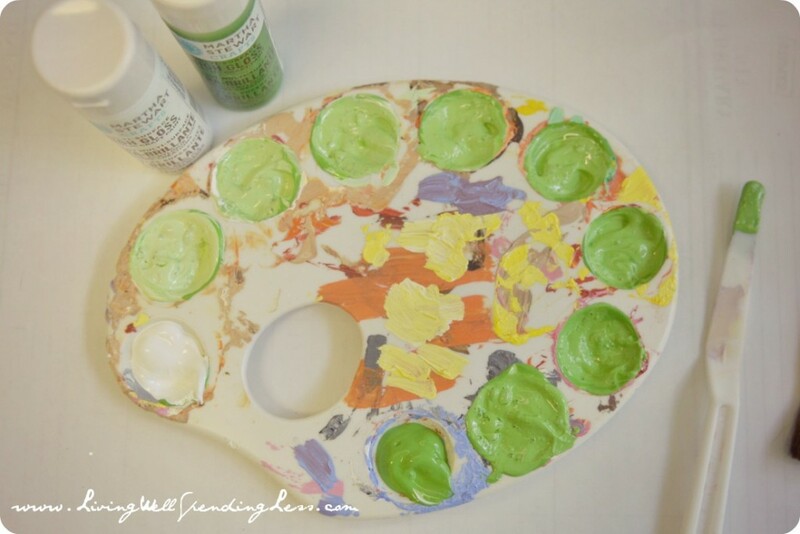 Step One: Blend your paints in variegated shades of green from light to dark as shown. 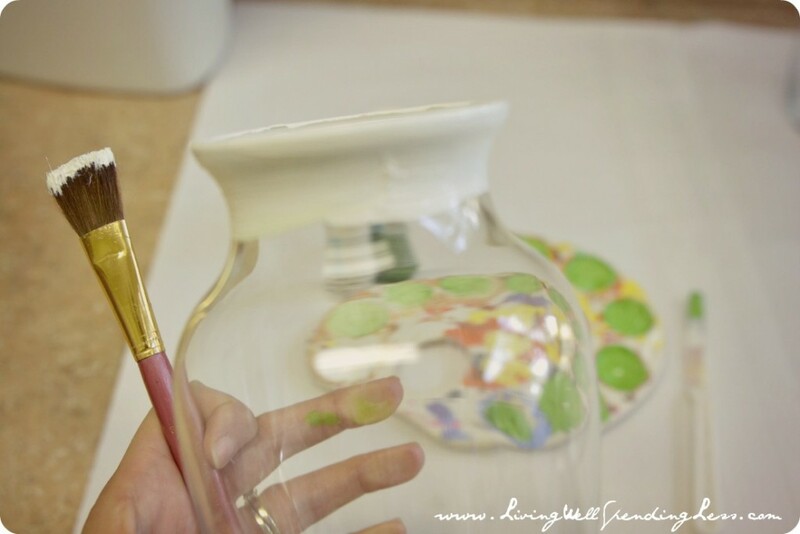 Step Two: Start by painting the top rim and top 1″ of the vase with white paint. Try to keep the line as straight as possible. Step Three: While paint is still wet, dip brush into second shade and create a new stripe, slightly overlapping with the first stripe. Step Four: Continue making darker and darker stripes all the way to the bottom of the vase. 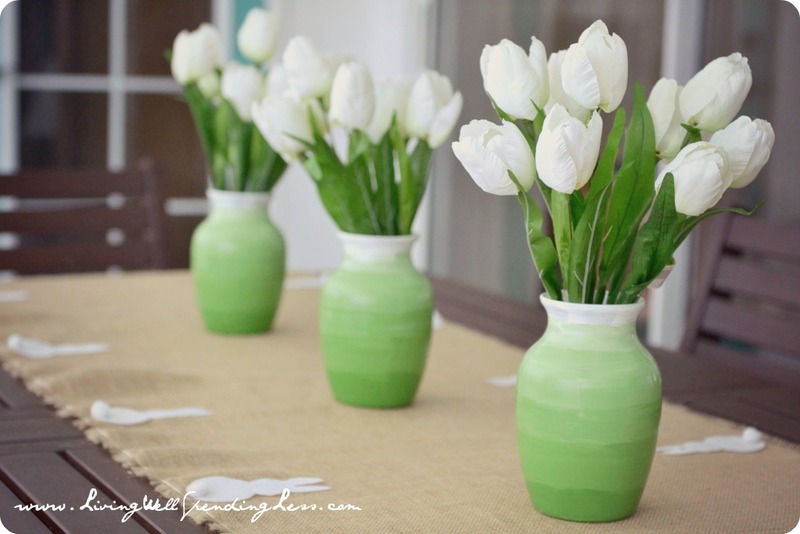 If you are doing more than one vase at a time, be sure to do each color stripe at the same time. Let dry completely. What is your main craft project criteria? Cost? Simplicity? Final result? Those turned out really great! Can’t wait to try this! I love this! Looks great, I will definitely be doing this soon. These are really darling. What a great idea. Where did you get the Martha Stewart paint? Hi Darcy – I don’t know where she got hers, but I get mine from JoAnns & Michaels Crafts. I love the thought of using different colors and making these for Christmas! I think these are so pretty. I have seen this done, but the person painted them from the inside to make the outside look more glossy. However, then you couldn’t put the flowers inside with the paint for fear of the chemicals killing your flowers. This seems like a better way and a great project! PS – I also love martha’s craft paints!! These vases are fabulous. I love the color. 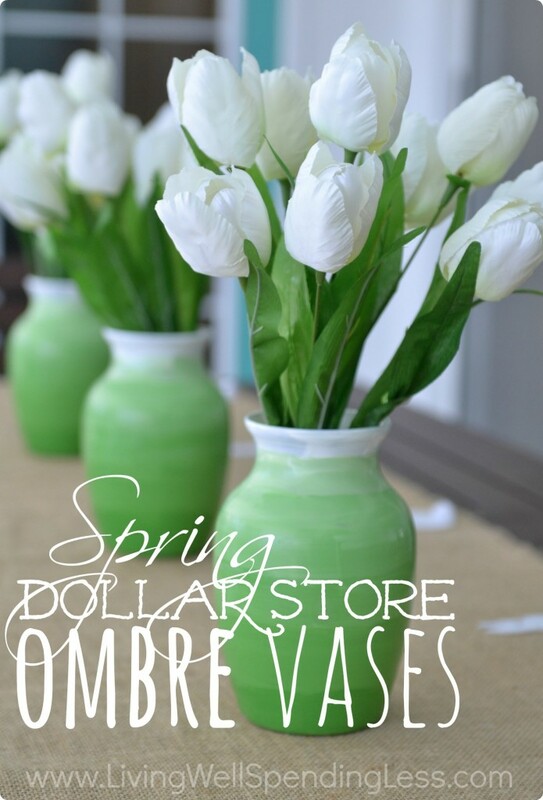 Perfect spring decor on a budget. What beautiful vases! 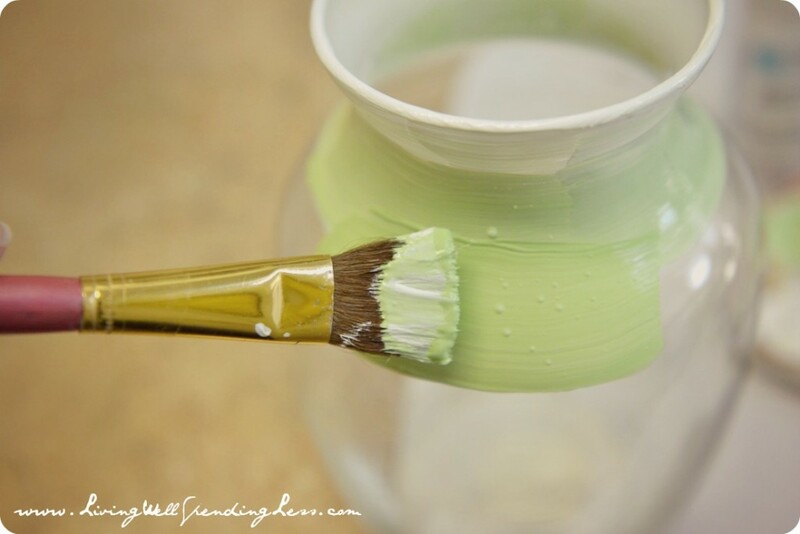 I love the ombre look and that it looks like a fun afternoon project! Thank you so much for this tutorial! I have a fetish for vases but I never quite know what to do with them. I absolutely love this project and the fact that you can personalize the colors to match my decor. Thanks so much! These are too cute, and I love the colors! I found this post on Today’s Creative Blog and am loving your blog. I LOVE these vases. Such a great use of cheap vases. Thanks for sharing! Love this and pinning! Came over from Creations by Kara! I love this idea! So fresh and spring-like! Very cute. I love the colors you chose. The transformation from a plain glass vase is fantastic. Pinned. Love these!! So cute and simple to make. Pinning to make some for the house! These are amazing. I have several of these vases. Pinned so I can go back and make them – in orange of course! those are fabulous! i love the ombre effect! Love the vases. Where did you get the tulips? The ones at our Dollar General and Family Dollar stores do not look like yours, life like, so I’m assuming you purchased yours somewhere else? Cost? 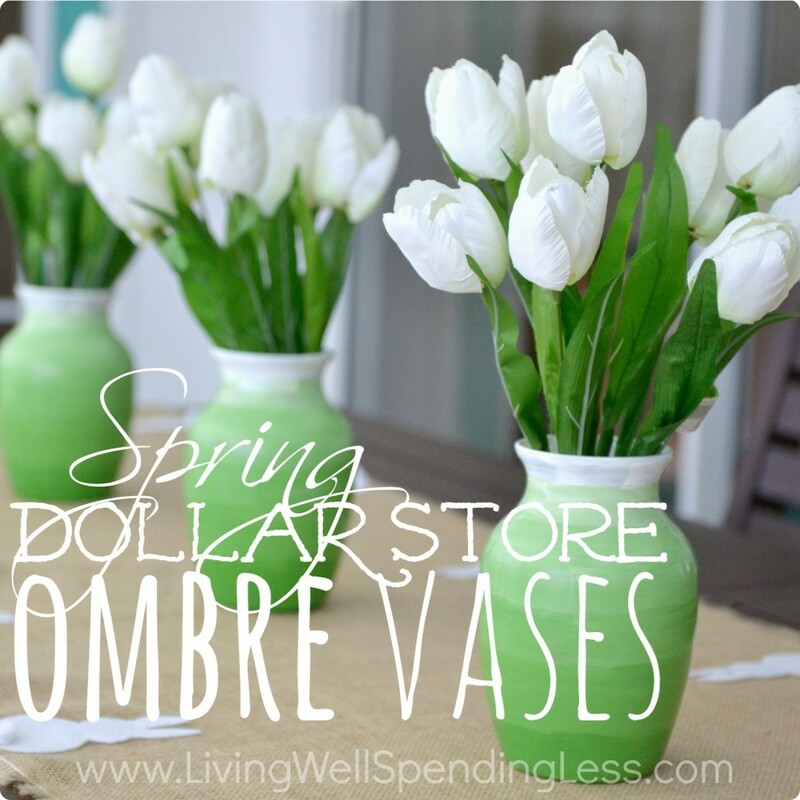 I’m so glad you like the Spring Ombre Vases! I bought the tulips at Joann Fabrics and used a store coupon. My daughter and I just made these and they turned out great. Only suggestion is to apply two coats. do you know if tempera paint would work as well? This is a cute idea. I was planning on giving a friend a keepsake floral bouquet as a gift along with a poem that I wrote for her. The flowers are going to be assorted colors. I was thinking of painting the vase with pastel shades of the rainbow. I think I will try it and see if it will work together! I have some white vases left over from my wedding business. What a great idea to transform them and customize them to my own color scheme. Thanks for sharing this. I love this idea. I’m gonna gift it to my friend.